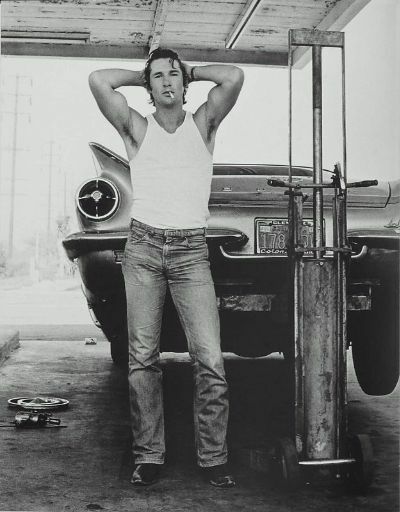 Los Angeles born Herb Ritts began his photographic career by taking pictures of his struggling actor friend Richard Gere in 1978 (Ritts later introduced Gere to future wife Cindy Crawford), when they stopped to repair a flat tire (see photo below right). By 1980 he had gained a reputation as a master of art and commercial photography. Ritts produced portraits and editorial fashion photographs for Vogue, Vanity Fair, Interview and Rolling Stone magazines. As well, he created successful advertising campaigns for cream of the crop clients: Calvin Klein, Chanel, Gianni Versace, Giorgio Armani, Levis, Polo Ralph Lauren and Valentino, among others. His fine art photography has been the subject of exhibitions worldwide, with works residing in significant public and private collections. Completely self-taught, Herb Ritts used clean lines and strong forms for a graphic, sculptural simplicity that engaged the viewer. Most always shot in black and white, the images challenged conventional notions of gender or race. Social history and fantasy were captured in his memorable photographs of noted individuals in film, fashion, music, politics and society. 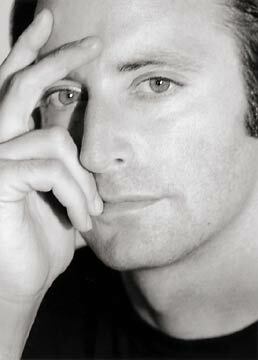 Starting in 1988 he directed numerous influential and award winning music videos and commercials. He worked on notable music videos for Madonna, Michael Jackson, Britney Spears, Chris Isaak, Janet Jackson, Mariah Carey, Jennifer Lopez and Tina Turner. Matthew McConaughey should be open about his sexual preferences. photos. German model for Vogue 1991 and Kim Bassinger. Herb style never dated just bought. Allure of beauty and style. To photographer love of Herb style!